It’s not just the story or the quality of production that had led to the podcast’s success. An additional factor has played a massively important part. First, let me set the scene for you. I was leaving work. It was Wednesday, it was really nice out. I could drive home with the windows open; for a little while at least. As I walked to my car I opened the Podcasts app on my phone. I needed to get a jump on selecting something to listen to on the way home. Safety first for this guy. I scrolled through my unplayed episodes and it was at that moment that I was struck by a sickening, sad feeling. What the (expletive deleted) was I going to listen to now? Of course I had some options, but that wasn’t the problem. Well it kind of was. Actually, it might have totally been the problem, and in that moment I realized why S-Town was as popular as it is: timing. It was all about timing. Those are good reasons, but I think that in order to fully grasp the current phenomenon that is the latest podcast from the Serial folks, examining the context in which it was released is important. Why? Because if any moment in time in the past year or so has all but begged and groveled for something like S-Town, it’s been these past few weeks. Since the Inauguration, we have been straight up slammered with depressing, scary, sad and down right reality-questioning news. Meddling Russians, frequent Executive Orders, more meddling Russians, conflicts of interests, baseless accusations, disheartening rationalizations, even more meddling Russians and a general feeling of disgust with our governing institutions have hijacked our lives. It has become hard to avoid at times, whether it’s notifications constantly popping up on our phone, Twitter being bombarded with the latest from 1600 Pennsylvania Avenue or late-night hosts devoting the majority of their shows to lampooning what might have happened that day. Escapism is becoming a lost art, something proving to be more and more unattainable with each passing day. Sports is always a reliable form of escapism, but sports has been somewhat hit or miss since that rough and tumble day in January when our current President took office. 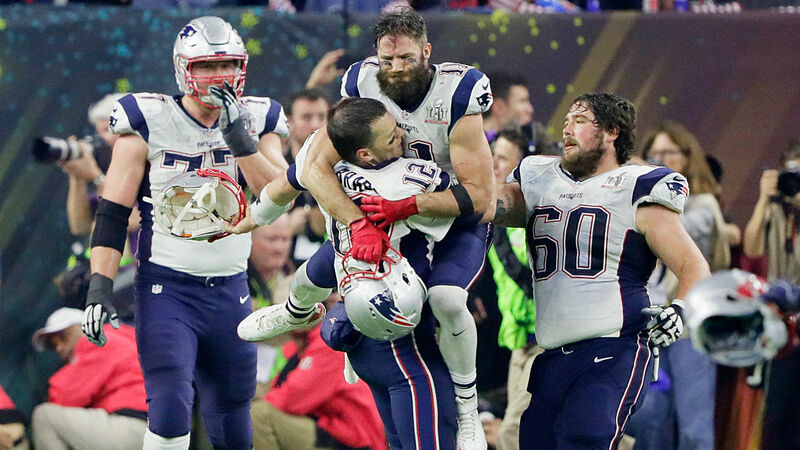 The Super Bowl was an unassailable high, but the time in between the Patriots’ amazing overtime win and the next noteworthy event, NCAA March Madness, felt like an eternity. You know, because even though February is technically the shortest month of the year, it feels like the longest month. Why? Context, dude. It’s the middle of winter, thus making it feel longer than it is because the middle of winter is the worst. So there we were, trudging towards the end of March, desperately hoping for some kind of good news, something to take our minds off of the nastiness ensnaring our daily lives and then on Tuesday March 28, amidst the confusing news of Devin Nunes sneaking on and off the White House grounds, Trump tearing up Obama’s environmental regulations and a handful of other tidbits of disparity I can’t even remember anymore, S-Town was dropped into our laps. Suddenly we had a distraction, a way to ignore all the depressing news, and could instead immerse ourselves into Brian Reed’s adventures into the heart of Woodstock, Alabama and the wildly interesting and tragically sad life of John B. McLemore. You could deep dive right in, soaking in the seven plus hours as fast as possible or you could spread it out, which is what I did. Instead of listening to a politics podcast or a sports podcast both to and from work, I could balance it out. Some news of the day in the morning, then some S-Town in the evening, or vice versa. I could follow the plight of Dan Taberski as he tried to find the suddenly reclusive Richard Simmons on the podcast Missing Richard Simmons on my way in and get back into the specifics of antique clock restoration later in the day. It was a very appealing situation to be in. With a window open just ever so slightly, S-Town was able to slide in and bring with it freshness and sunlight, as well as a more-than-welcome distraction at a time when we needed it more than ever. The podcast would no doubt be popular regardless of the release date, but I can’t help but think and believe that it has raked in the numbers it has because of timing. The Bachelor is kind of in the same boat here. Obviously people would watch that show, no matter when it aired, but I do think the fact that it airs in the dead of winter, on Monday nights, contributes to the show’s success. It’s there when we need it most, just like S-Town. When something is released never seems to get the kind of love and attention it deserves when we’re talking about the success of something, but I think it’s worth noting. You can’t tell me that Drake’s album mix tape playlist More Life wouldn’t be even more popular than it is if he had dropped it on the cusp of summer. It’s full of potential summer jams! That was a missed opportunity, sir. The same could be said for Calvin Harris. He should have totally put off releasing “Slide” for a couple months. Since Serial brought podcasts into the mainstream in 2014 there has been no shortage of podcasts for a person to listen to. There is a podcast out there for everything, something for you no matter your interests, political leanings or preferred sports team. Want a breakdown of the latest episode of Game of Thrones or The Bachelor, you literally have dozens of options to chose from. It’s fantastic. It’s like the current state of television, where there are endless shows and hundreds of channels, on steroids. Yet the downside of that is the lack of one or two consensus of podcasts, just like there have been a dearth of consensus television shows outside of Game of Thrones. Everything is more fun when you can then talk to someone about it. But if we’re all listening and watching different things, that makes it hard to do. I would love to talk about the most recent episode of The Americans with someone, but no one around here watches it. In terms of podcasts, I’ve been hooked on Crimetown for a couple weeks now, but I have been the only person I know who has been following along with the history of organized crime in Providence, Rhode Island. In the Dark got some attention, but even that show’s scope and audience was somewhat limited. That one podcast that everyone is listening to just hasn’t been there and since Serial, mainly the first season, although it was true to a lesser extent with the second season, we really haven’t had that. And then S-Town came along, and within a few days, it was all anyone could talk about. One of the results of Serial’s popularity was that it turned people onto podcasts, people who hadn’t given them the time of day before a friend urged them to give Serial a shot. S-Town seemed to gobble up those remaining few who still hadn’t latched onto them. And also like Serial, conversations about S-Town were happening in a variety of situations. I was involved in two different conversations about the show at my daughter’s birthday party this past weekend and I don’t have enough fingers to keep track of the number of articles and think pieces I have at least skimmed about the show. As someone who considers themselves an avid listener of podcasts, it was definitely refreshing to ask someone if they had heard of this new podcast I was listening to and have them actually answer yes. One of those age old sayings is that timing is everything. Yes, it’s not the only thing, but it’s definitely a major thing. S-Town is great new podcast because it’s an exceptionally produced story about interesting and engaging content. It’s haunting, sad, funny and captivating. However, S-Town is popular because in addition to those factors, it was released at the exact perfect time, at a time when we needed it most.